We got another Kit fan art, whoop! She popular. How cool is her mechanical arm here? It’s based on a motorcycle carburetor. Creative. 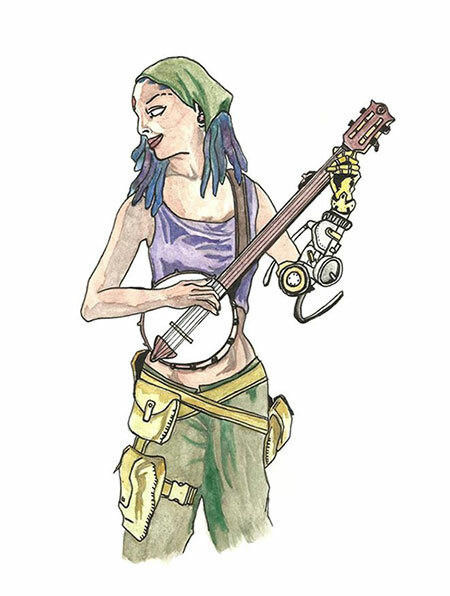 Also, she has a banjo. A freakin’ BANJO. (She’s more of a bassist kinda gal but I’m going with this). This fantastic illustration is by John Marsh, go check him out and give his facebook page a like! We’ve joined the hordes at Zazzle, so if you fancy getting your mitts on some unique RetroBlade merchandise you won’t find anywhere else, take a look here. We have a cast page now! We will be adding new voting incentives at the beginning of each month.